Most corporate communications are not believable, according to Lord Browne, the former chief executive of BP. 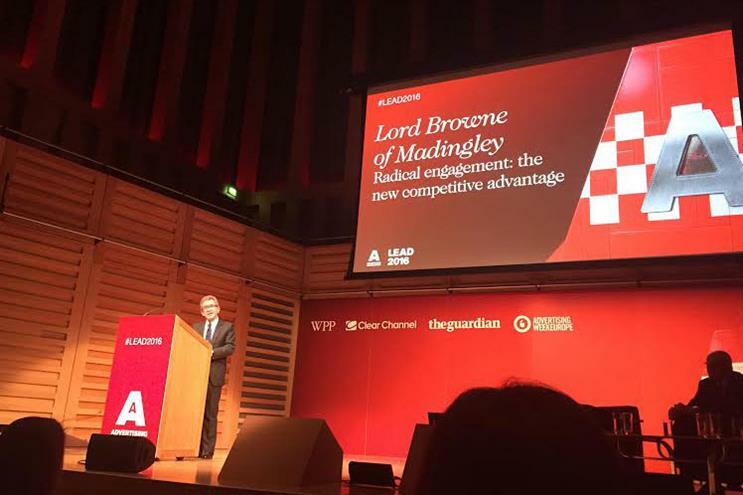 Addressing the Advertising Association’s Lead 2016 conference in London today, Browne warned that it was harder than ever for business to win and retain the trust of consumers because of a legacy of "incredible" messaging and "failed" attempts at corporate social responsibility. Browne said: "It seems to me that businesses only really do gain trust when they try and engage with the concerns of society into everything that they do and CSR has been the primary way in which businesses have sought to build that relationship. "But it’s really failed. CSR is usually detached from a company’s core purpose, it is not recognised by the people doing the real business. It is often a plaything, a headquarters activity and not attached to what a company’s really doing." He went on to say that CSR had become a "very dangerous crutch" and cited examples of companies with exemplary CSR records that ended up at the centre of corporate scandals, such as Enron, Lehman Brothers and VW. Browne also argued that brands should be more honest in the way they communicate with the public and said it was no better in the government, where civil servants were afraid of "having their head chopped off" if they admitted mistakes to the public. He said: "That doesn’t actually happen if you admit a mistake. Normally there’s silence because there's nothing to reveal."